The Pyle PT265BT receiver features Bluetooth to stream wireless audio from your device. Play your entire MP3 digital music library from your cell phone, PC or Tablet. 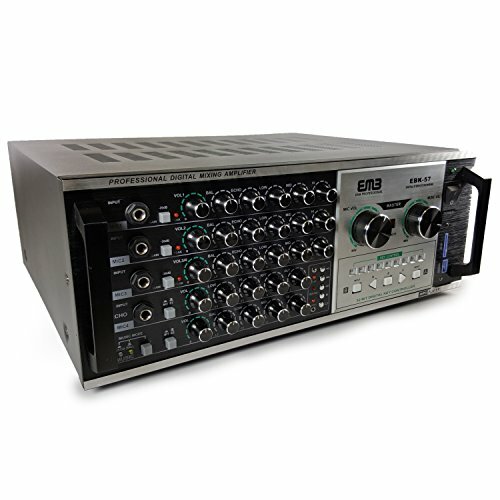 This amplifier receiver system features AM/FM radio with 50 station memory presets, digital LCD display, two microphone inputs with separate volume, bass, treble and echo controls -- to create a unique mixing experience. Create an instant karaoke party when you mix the two microphones over any audio that plays through the system -- sing along with your favorite radio station or Bluetooth wireless streaming audio from your device. You can also connect additional external devices like a CD player or another receiver through the AUX inputs. Upgrade your home entertainment system with the ability to turn any time into Karaoke time with the PT265BT Amplifier Receiver. The AKJ7406 comes with the power of 1000W max. (500W + 500W max.). The Power Output is (@ 4 Ω). Includes High Quality Dual Digital Echo Effects with VOL/LO/HI/RPT/DLY Controls and Seven Microphone Inputs (Four at the Front Panel and Three at the Rear Panel). It also includes the following features: Two Audio Inputs and One USB/SD Card MP3 Data Interface Subwoofer Output and Controls, Master Microphone Volume Control, Three Individual Microphone Volume Controls (MIC1, MIC2, and MIC3/MIC4), Three Individual Microphone Tone (BAL/ECHO/LOW/MI/HI) Controls (MIC1, MIC2, and MIC3/MIC4), Master Music Volume Control and Music Volume/BAL/ECHO/LOW/MI/HI Controls. 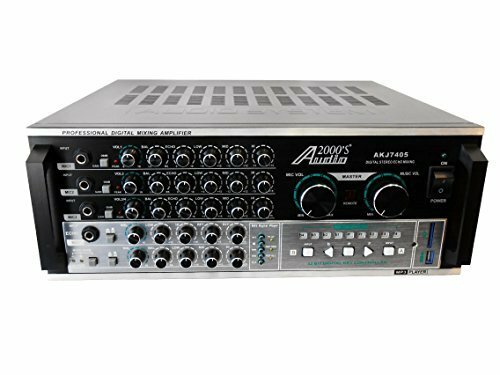 The Audio2000'S AKJ7405 is a Professional Mixing Amplifier with 600W max. (300W + 300W max.). The Power Output is (@ 4 Ω). High Quality Dual Digital Echo Effects with VOL/LO/HI/RPT/DLY Controls. 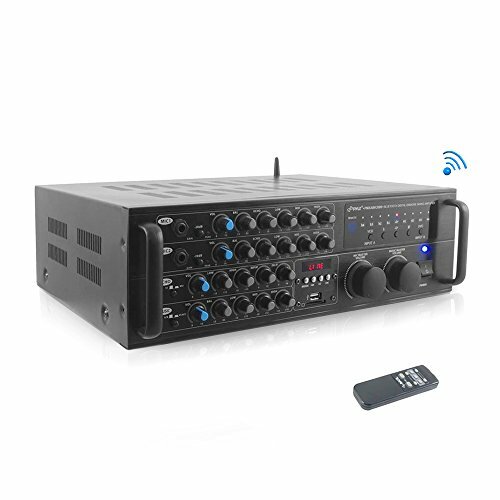 This amplifier includes: Seven Microphone Inputs (Four at the Front Panel and Three at the Rear Panel), Two Audio Inputs and One USB/SD Card MP3 Data Interface, Subwoofer Output and Controls, Master Microphone Volume Control. Three Individual Microphone Volume Controls (MIC1, MIC2, and MIC3/MIC4), Three Individual Microphone Tone (BAL/ECHO/LOW/MI/HI) Controls (MIC1, MIC2, and MIC3/MIC4), Master Music Volume Control among other features. The Pyle PMXAKB2000 karaoke mixer features Bluetooth wireless streaming from your device. Play your entire MP3 digital music library from your cell phone, PC or Tablet. This rugged rack mountable mixing amplifier will make your karaoke jam one to remember. The amplifier produces a powerful 2000 watts (1000W + 1000W at 4 Ohms) of power and the mixer features two microphone inputs, two line inputs and two video I/O connections. Each channel features an EQ section and echo adjustment dial for applying just the right amount of EQ or effect to specific channels. Additional features include USB and SD memory card readers for MP3 digital audio file playback and LCD display. All the professional karaoke features are built in to this unit, including, a 9-step digital key control and digital echo. Connect external devices like outboard effects processors using the effects loop input. The Pyle PMXAKB2000 is guaranteed to provide all the power and mixing capabilities for your professional or private needs. DA-9800RV 600W Professional Digital Key Control Mixing Amplifier w/DSP Rever. 4 speaker output for increased sound coverage. 150W + 150W continuous power output (4 ohms).